Don’t you just love spontaneous actions that really pay off? Bri and I had one of those feelings late yesterday evening. We packed up the D300, a blanket, a quick bite from Whole Foods Market and drove out to Torrey Pines State beach. 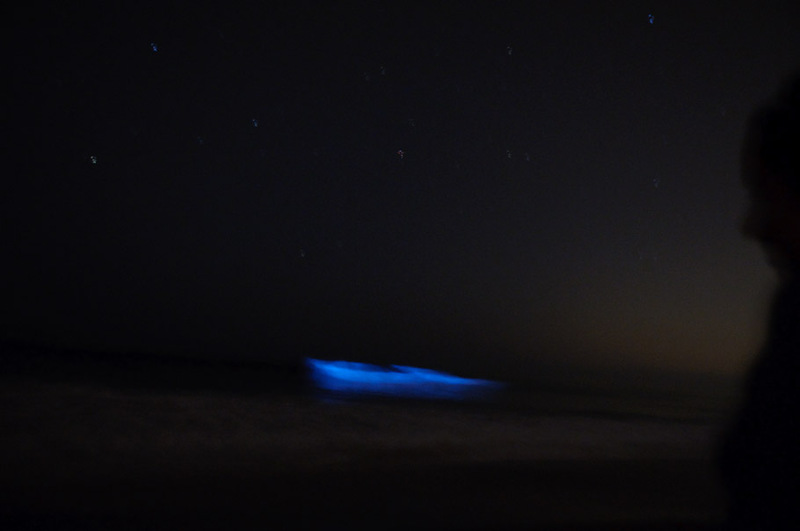 To our surprise, it turned out to be a night filled with Bio-Luminescence! I wasn’t sure what was more intriguing, the waves or the sand. Surrounding each barefoot step in the warm sand was a light show from out of this world! I tried to get a decent image of Bri carving hearts in the sand, but it was tricky without a tripod and with the D300. But you can just see some faint light in the top right picture below. All of the shots were taken with the D300 and 17-55mm 2.8 DX lens handheld, with an ISO 1000-2000, 2.8 aperture, and at least 5 seconds of shutter. I tried to keep the images are real as I could so only image tweaking was a tiny tiny bit of noise reduction. The blue was brilliant! Oh and I realized, I have two pet peeves at the beach after dark. First are rednecks (I am one, therefore I know :) with their 100,000 candle watt flashlights powerful enough to ignite wet seaweed staggering down the beach to the people in their idling cars burning their headlights into the night sky for no reason. Seriously!